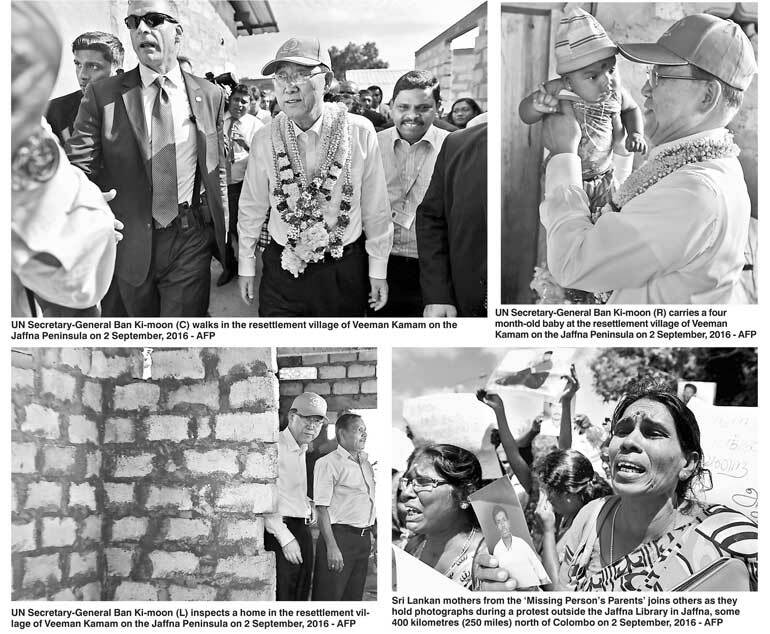 Disappearances, resettlement and detentions under the country’s draconian anti-terror legislation – all lingering issues from a 26 year civil war - took centre stage yesterday as UN Secretary General Ban Ki-moon visited the formerly embattled Northern Province for the first time since 2009. Today, the area is full of construction activity with the UN funding ‘transitional shelters’ – a two roomed cement structure and an aluminium sheet roof – for returning families. Visiting resettled families in the Veemamkamam Colony, Ban shared a lighter moment during his Northern tour when he gifted autographed UN caps to two young boys in the village. 13-year-old Prakas Premadas, who wants to be an engineer when he grows up, was one of the recipients. Prakas lives with his mother and three siblings in the tiny room, where a tiny television and cable TV box are given pride of place. The family returned there seven months ago, after being displaced in 1990. On the opposite side of the road, Rasakurendran Vanitha, 49, had worn a white and gold sari in honour of the UN Secretary General’s visit. The Government land once granted to her father that she was displaced from as a young girl has since passed down to her. While she is thrilled to have finally come back home, Vanitha stresses that livelihood remains a major issue. She goes out to work in a small onion farm several times a week for wages of about Rs. 500 per day to support her family of five children and little grandson. Her son Jeyalaxman is able to get mason work in the area at the moment, but she says the family will find it difficult to manage once the resettlement drive is complete. Northern Chief Minister C.V. Wigneswaran told visiting UN Secretary General Ban Ki-moon in Jaffna yesterday that there could be no reconciliation without addressing accountability issues relating to the final stages of the war. Chief Minister Wigneswaran who secured a one-on-one meeting with the UN Chief separate from the Tamil National Alliance delegation, said he told Ban that there had been no perceivable, ostensible steps taken to put an accountability mechanism in place. Wigneswaran explained that he had sought a separate meeting with Ban because the TNA delegation comprised of Parliamentarians who would raise different issues. The Northern Provincial Council (NPC) had separate, local and administrative issues to raise, the Chief Minister said. “The Northern Provincial Council works within the 13th Amendment. So it is the NPC that understands the administrative problems and shortcomings of the 13A and there were matters closer to the workings of the NPC that needed to be discussed,” he told Daily FT in an interview.